Haunting beauty. Uplifting melancholy. Organic etherealness. Such contradictory descriptions seem nonsensical, unless you've just listened to Falloch's debut album Where Distant Spirits Remain. The Scottish duo of Andy Marshall and Scott McLean have captured the essence of bands like Agalloch, Anathema, Primordial, and Sentenced and have emitted a seven-track experience of disarming flutes, unassuming vocals, misty post-metal riffs, and unavoidable emotional investment. Giving an account of Where Distant Spirits Remain is much like describing a lush valley enveloped by a morning fog, or a crystal-clear mountain stream as it meanders by before plummeting in a cascade of mist and sound. To create such a lush atmosphere, Marshall and McLean rely heavily on post-rock aesthetics to enhance their largely muted riffs. Copious amounts of cymbal crash fuse together with the plucky guitars and mournful synth to build a diaphanous veil through which the vocals emerge, almost hesitantly, only to be chased away by bursts of sonic aggression. Indeed, Where Distant Spirits Remain is not all mood and melody, though the greater proportion of it certainly is. The tremolo riffs and blast beats that drive the latter moments of "We Are Gathering Dust", the Anathema-like atmospheric riffs and harsh vocals of "Beyond Embers and the Earth", and the blackened shrieks that haunt "Where We Believe" are typical of how Falloch's metal influences creep to the surface, disturbing the placid waters not unlike a deliberately cast stone. I've listened to this album repeatedly, often back-to-back, for several days now and have yet to tire of the journey it takes me on. The acoustic Spanish guitar and mystical female vocals heard on "Where We Believe", the saddened Celtic flute on "Beyond Embers and the Earth", and the mesmerizing Native American flute on the instrumental "Horizons" are examples of how Marshall and McLean effortlessly combine a plethora of unique elements together to produce a listening experience that is truly engaging. To attempt to dissect Where Distant Spirits Remain in order to highlight a track or two would be futile, for the album is absolutely greater than the sum of its parts. Cliché perhaps, but no less true. 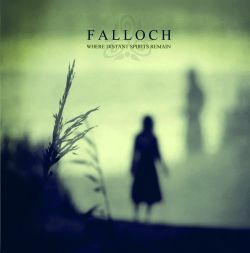 Fans who enjoy the more moody, atmospheric side of metal presented by bands like Agalloch, Fen, and the like will unquestionably enjoy Where Distant Spirits Remain. This album is a no-brainer purchase and, I'm ready to declare right now, one of my Top Ten for 2011.